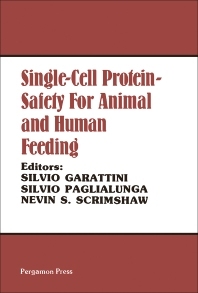 Single-Cell Protein: Safety for Animal and Human Feeding covers the proceedings of the Protein-Calorie Advisory Group of the United Nations System Symposium “Investigations On Single-Cell Protein,” held at the Istituto di Ricerche Farmacologiche 'Mario Negri' Milan, Italy, on March 31 – April 1,1977. This text is divided into three parts. The first part discusses taxonomy and pathogenicity, including topics on strengths and weaknesses of traditional criteria in the systematics of yeasts; DNA relatedness between physiologically similar strains and species of yeasts; and studies of potential pathogenicity of industrial yeasts. This book then explains the models of pathogenicity for yeasts of the genus Candida, as well as the characteristics and comparative studies of this genus. Metabolism and toxicology of odd-numbered carbon chain fatty acids are also tackled, which is the main topic of the second part of this book. The last part is concerned mainly with the metabolism and toxicology of alkanes. This publication will be invaluable to chemists and students of chemistry and related disciplines.